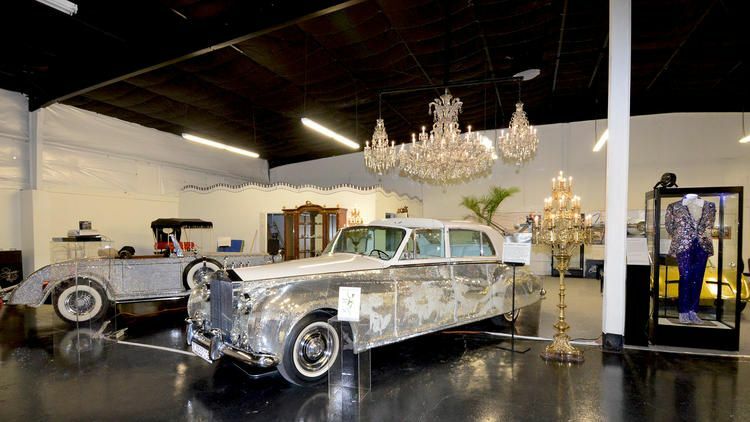 Cars as spangly and over-the-top as their onetime owner, Liberace, are once again on view in Sin City. 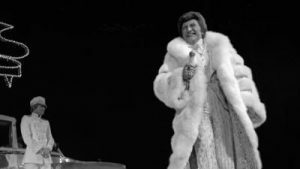 For those too young to know the Las Vegas showman, Liberace was a pianist who played for laughs and known for his outrageous costumes. 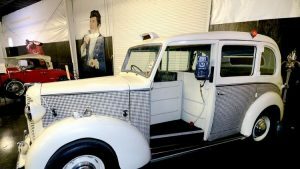 The Hollywood Cars Museum, just across Interstate 15 from the Strip, is the new home to several sparkly vehicles in its newly opened Liberace Garage. For years his cars were displayed in the Liberace Museum, which closed in 2010. Nearly 30 years have passed since the death of the famed pianist known as Mr. Showmanship. Fans lucky enough to have seen him perform may remember some of the cars displayed in the Liberace Garage, which opened in early April. The 1961 RollsRoyce Phantom V that was part of his long-running show at the Las Vegas Hilton. It also appeared in the 2013 HBO movie “Behind the Candelabra,” for which actor Michael Douglas won numerous awards. The 1952 Rolls Royce Silver Dawn convertible painted red, white and blue to celebrate America’s bicentennial. The London taxi in which Liberace would pick up friends at the Palm Springs airport (shown above). The garage also contains some of Liberace’s famous costumes and one of his pianos. They’re now owned by the Liberace Foundation , which provides scholarships to budding young musicians. The museum is located at 5115 Dean Martin Drive, Las Vegas. It’s open 10 a.m. – 5 p.m. daily. Adult admission is $20; children 15 and younger are free with a paid adult ticket.